Leprosy clinic at Jindapur in 1991. 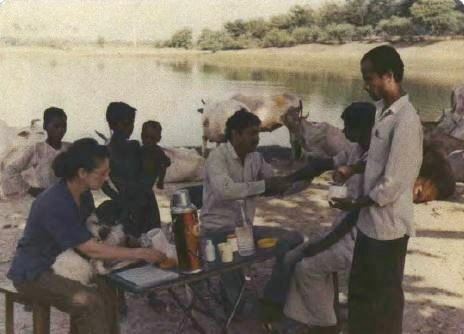 Visitors to the Maitri Charitable Trust’s center in Bodhgaya are confronted with an apparent jumble of activities – lines of coughing TB patients, crying babies, bandaged leprosy patients loitering in the sun, bleating goats, and, above all, dogs all over the place. Their perplexity is palpable, and the unuttered remark can be read in their eyes: “From leprosy to animals – what on earth is all this?” Still dazed, most choose the program that appeals to them, give a donation and go. Some will remain faithful supporters of either the human or the animal work, making it clear that the money should go ”only to that specific program”. It seems that the concept of integration as proposed and actualized by Maitri is generally not grasped well, Adriana Ferranti reports. When I drew up the plan of the future Leprosy Center, complete with name, logo, campus description, and ten-year budget, and submitted it to Lama Zopa Rinpoche for blessing and approval in 1987, my view was that eventually Maitri would take care of other manifestations of human misery besides leprosy. But, as Rinpoche put it, “Not yet –later.” I therefore wholeheartedly concentrated on establishing the leprosy eradication program, with the goal of detecting and treating leprosy-affected people, the hansenians, throughout the area allotted to us by the government, in painstaking door-to-door surveys and at numerous, ubiquitous monthly field clinics. One of the features of leprosy work is the social rehabilitation of those disabled by the disease, for which an in-depth assessment of the economy of villages is necessary. Since patients under the program are not confined in colonies, but are treated at home, they must “fit in,” thus the idea of rural development started forming in my mind. However, I soon understood that in Bihari rural society the concept of vocational activities is still mainly tied to the caste set-up, and in fact so far leprosy patients have not manifested any inclination to learn any other skills, as they have managed to adapt their disabilities to whatever work is available in their “society” (read caste). Rehabilitation of the hansenians has thus become limited to physical therapy, mostly consisting of reconstructive surgery, and rural development has turned into a broader, ideal plan that has gone beyond leprosy work.